Asparagus Soup - A healthy, hearty soup to help you eat more veggies! I never used to eat asparagus. It was one of those vegetables I would pass over in the supermarket and never glance its way. That all changed on our honeymoon in Florida over three years ago. I can still remember the restaurant in St. Pete’s beach where my husband and I both ordered steak. It came out with some asparagus on the side and from that moment on, we were both hooked. Asparagus now features on our menu at least twice a week. I created this asparagus soup as an homage to our favourite vegetable! I’m so happy with this recipe. Seriously, I would eat this every day! Asparagus is not only delicious. It’s really healthy too and is a good source of folate as well as vitamins: A, C, E and K. It’s very versatile too and tastes great roasted, grilled, steamed or sautéed. In general, we are a big fan of soups in our house. They make eating lots of vegetables easy and I love making big batches to freeze for work lunches later. 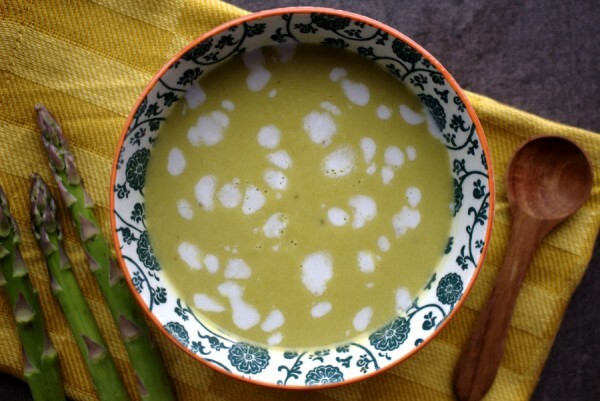 The coconut milk in this recipe makes this asparagus soup taste “creamy” and rich but without the dairy. This is a firm family favourite and we especially love this in the winter to warm us up! This recipe uses my roasted vegetable stock recipe. If you don’t have time to make that, you can use a different stock. Just make sure it is SCD-legal. 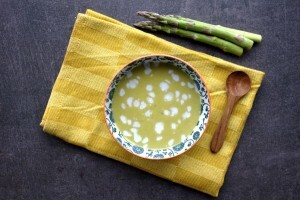 A delicious hearty and healthy asparagus soup free from: gluten, grains and dairy. An easy way to eat more veggies! Melt two tablespoons of olive oil in a large saucepan on a medium to low heat. Add the onions and garlic and sauté until soft and translucent. Add in the ginger and tumeric and stir well. Add in the asparagus, courgettes/zucchini, vegetable stock and coconut milk. Season well with salt and pepper and bring the mixture to the boil. Then, reduce and simmer on a low heat for 20 minutes. Transfer the soup to a blender and blend to desired consistency. Decorate with extra coconut milk if desired.